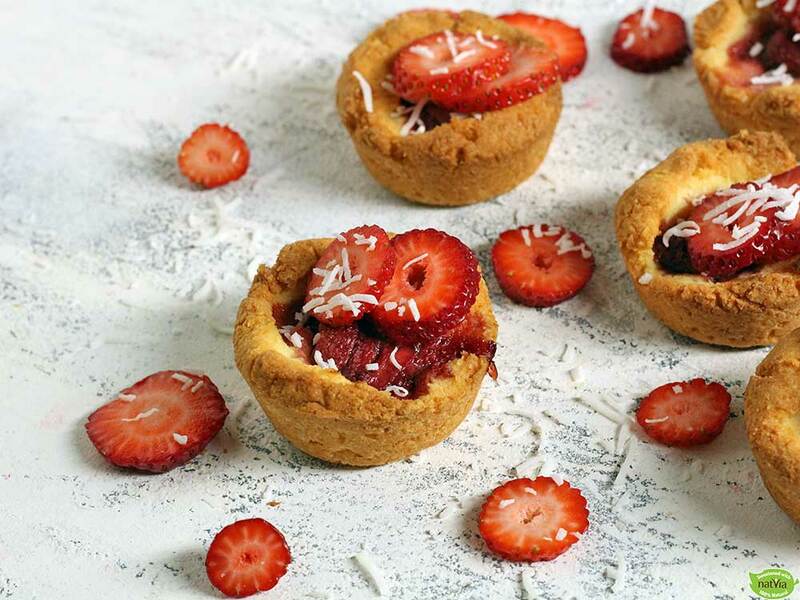 This is a healthy vegan dessert recipe alternative made completely without sugar. 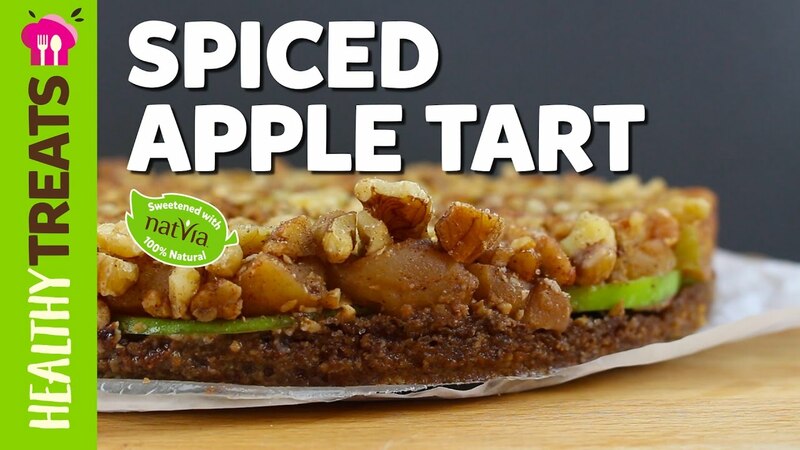 Vegan Spiced Apple Tart recipe by Natvia. Preheat oven to 170°C & prepare a springform baking tray or similar tray. Add the macadamias, walnuts and a pinch of salt to a food processor or blender. 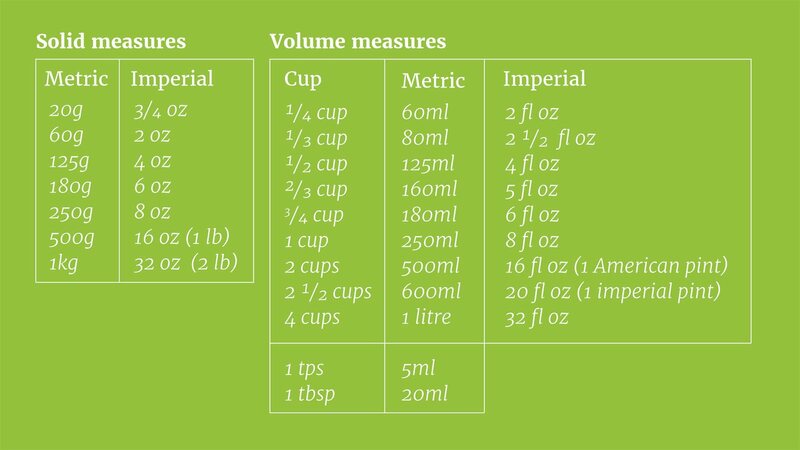 Measure out 2 tbsp of Natvia and also add to the processor or blender. Start to blend together the ingredients until it has mixed together evenly. Once the mixture has become like crumbs, place in a mixing bowl. Add 1 & 1/2 tbsp coconut oil whilst stirring (melted coconut oil is recommended). Once the mixture has been stirred and combined with the coconut oil, evenly spread into a lined springform pan. Flatten out the mixture into the springform pan and bake for 15 minutes at 170°C. Whilst the crust is baking, peel & dice at least 2 of the green apple. Add the diced apple cubes into a saucepan, along with 1 tsp cinnamon, 1/2 tsp nutmeg, 1 tsp Vanilla Extract, and a pinch of salt. Add a small amount of water (approx 1/4 cup) and stir together. Add this wet apple mixture to a medium-low heat whilst stirring. Once bubbling and simmering, place a lid on the top of the saucepan and leave heating until the mixture starts to stew and soften. Once the lid has been placed on the saucepan, thinly slice another apple (or two, depending on your green apple enthusiasm) into disc shapes, and set aside. In a new bowl, add 90g pecans, 80g walnuts, 1/2 tsp cinnamon, pinch of salt, and 1 tbsp Natvia. Use your hands or utensils to thoroughly combine the dry ingredients, and set aside. Remove the stewing apples from the heat, and if you like add just a squeeze of lemon to avoid further browning (and to add a slight zest!). Remove the crust from the oven if you already have not done so. 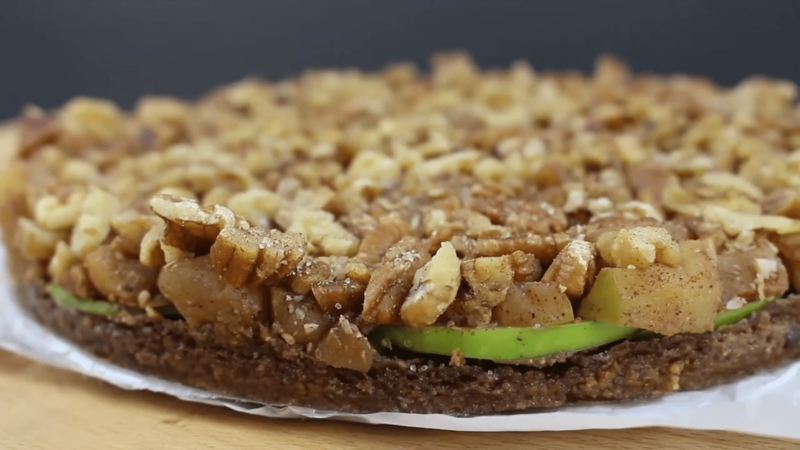 Lay down the disc shaped apple slices on top of the crust evenly, thus making an apple layer. On top of the apple layer, add stewed apple filling and spread around evenly. Add the nutty topping mixture on top of that and also spread it around evenly to cover the apples. Lay a layer of baking paper down on the top of the dessert, and place another baking tray on the top of the baking paper to flatten down the contents. 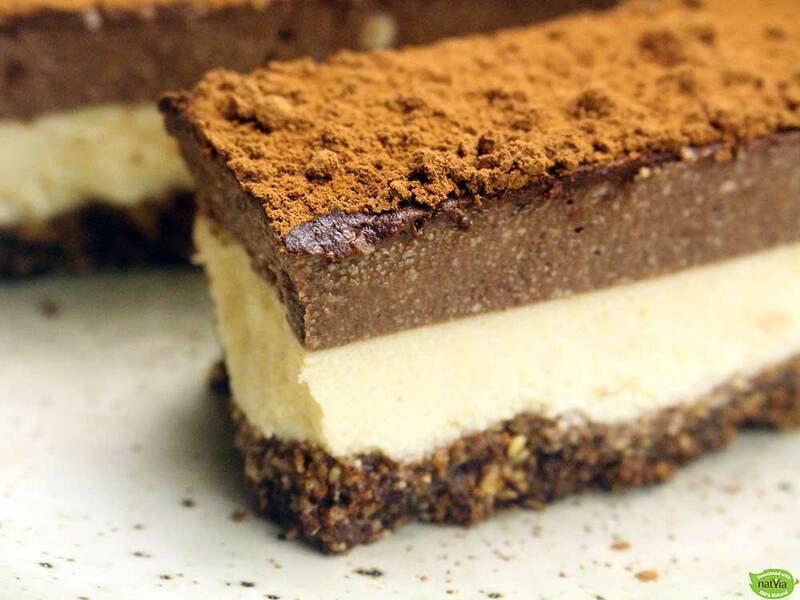 Place the flat content in the fridge to chill for 2 hours, then take it out, slice and enjoy!